Dealing With a Portable Router That Keeps Bogging Down? Home / Woodworking Articles / Portable Router That Keeps Bogging Down? If you’re working your router extra hard, you might notice it’s slowing down and not putting out as much effort as it did at the start of your project. This loss of power – referred to as “bogging down” – happens for a number of reasons, and the solution depends on the cause of the bog. If you’re working with a wood that’s full of knots or sap, you can expect your router to bog down at some point. Pine and plywood both cause your router to snag or stall and this stalling creates excess heat. The heat comes from your machine trying to power through the wood and results in a loss of power. To overcome heat-related bog, choose your wood wisely. Avoid knotty, sticky woods whenever possible. Consider cutting your project before routing it with another tool: a jigsaw, for example. 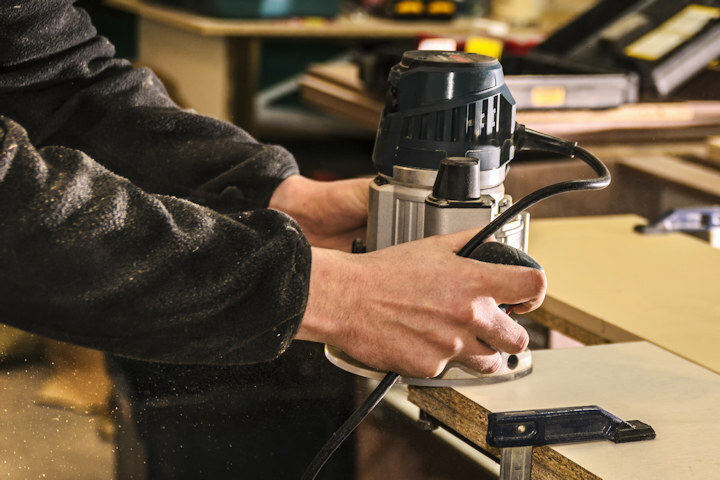 Whenever possible, pre-cut or create guides for your router to help it glide more easily through your project to cut down on machine bog from overheating. If you’re using an extension cord — even an industrial one — to run your router, stop right now and move closer to an outlet. Not only does this pose a safety hazard because of the amount of current your machine draws, but it can cause a loss of power which can lead to bogging down. If your machine isn’t getting adequate power to run full speed, you can expect a bog. Loose connections, faulty cords and inadequate outlets can all contribute to a bog down in your routing. Check your equipment, power cords, and outlets before starting your project: it’s a good safety routine to get into and will help prevent bog due to power loss. If you’re using a larger bit, you’ll need more power to run your project. Selecting the right bit for the job is part of the art of routing: more problematic woods that already take more power to route benefit from being worked with smaller bits. Because smaller bits take less power to run at full speed and strength, you’re less likely to see a bog when working. While time and experience will help you in selecting the right bit, consider the input of other woodworkers when embarking on a project with an unfamiliar wood. Run a test on scrap of the same type whenever possible to cut down on problems before running your actual piece. When your router needs maintenance performed, it’ll let you know by exhibiting a whole host of problems, including bogging down. Give your router a thorough brush down and cleaning to remove any dust and scraps hiding in nooks and crannies. If it’s been a while since you’ve serviced and oiled your router, consider taking a half hour or so to disassemble and lube it up. Make sure all parts are in good working order and everything is tightened to optimal tension. Because maintenance is a regular requirement to keep your tools in good working order, it can’t hurt to do a cursory check of things prior to starting your project to beat the bog before it happens. When your router isn’t running to its best performance, bog is just one of the problems that can occur. Give your machine a check from top to bottom, including the outlet it’s plugged into, to determine if the bog is related to maintenance needs. If not, consider the wood you’re using and whether the bit is the correct type and size for your project. If all else fails, consider trimming any excess you can away from your project or creating guide marks with another tool to reduce the amount of bog you experience and ensure your router runs smoothly. What’s the worst offender for creating bog that you’ve ever encountered?